On the face of it, our Divine Mercy Intercessory Prayerline could double for a business office anywhere, except for a couple notable distinctions. Within those cubicles, those aren’t operators standing by to take your order; they are intercessors standing by to take your prayer petition. And the business at hand here isn’t financial (the service is free), but rather it’s to serve others in a spirit of love and compassion. Send us your prayer petitions. We will pray for you. "Intercessors listen, take callers by the hand, and bring them before the Lord," says Kenny Bouzan, the Prayerline's supervisor. "We stand beside them and pray together with them. They are no longer alone in their pain. "We hear, we care, we are non-judgmental, and we continue to pray for them long after the call has ended," Kenny continues. "Many callers, too numerous to count, thank us for being there for them, as they have no one else to turn to." The Divine Mercy Intercessory Prayerline is an apostolate of the Association of Marian Helpers, located on the grounds of the National Shrine of The Divine Mercy, in Stockbridge, Mass. We can tell you with certainty: Prayers work! 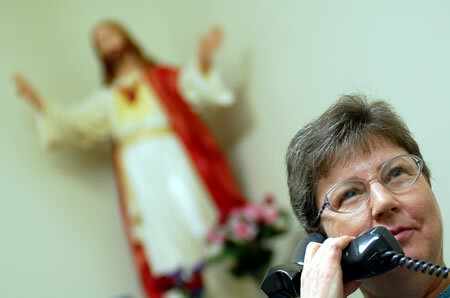 Since 1995, we've received countless calls, e-mails, and letters from people telling us how their prayers had been answered, whether they were everyday needs or matters of life-and-death. Cancers have been cured. Comas have been reversed. Jobs have been found. Marriage problems have been resolved. When we trust completely in our Lord, He pours out an abundance of mercy. The ministry's staff is available daily from 8 a.m. to 4:30 p.m. (EST).